This bright necklace is crafted from medallions of dried fruit and vegetable "parchment." Like a wearable garden, this necklace captures and displays the brilliant, translucent colors and organic textures of fresh fruits and vegetables. Maggy Ames presses, cures, ages and dries selected produce, transforming it into colorful parchment-like sheets that she anneals to hand-shaped copper forms. 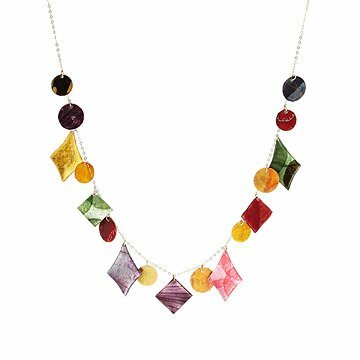 This rainbow of vegetable parchment glows over copper diamonds, squares and disks which swing freely from 24k gold fill chain, with a generously sized gold vermeil toggle clasp. Each necklace is made with its own unique selection of vibrantly colored fruits and vegetables, so no two are the same. The enclosed care card lists the many different varieties that make up each one-of-a-kind necklace (including red onion, beet, blood orange, purple cabbage, pink grapefruit, cantaloupe, watermelon, Thai green papaya, Mexican papaya, zucchini, plum and others). The kaleidoscope of translucent, jewel-like colors will complement any outfit, and is light and comfortable enough to wear every day. Handmade in California. Water resistant, not waterproof. Do not submerge in water, avoid showering and swimming while wearing. Disk Pendants: approx 0.59" dia. Due to the handmade nature of this item, each necklace may vary in color assortment slightly. I've gotten a lot of compliments about this piece. I love it! This necklace is lovely, and the colors are amazing. I expect to wear it a lot and receive compliments on it every time. I love it! I have a best friend who is very conscious of environment and farming locally. She received this necklace and there wasn't a more perfect gift!!! It is beautiful as she is!